Modeled on Bangkok’s impressive network of water taxis that ply the many canals on the east of the Chao Praya River, Phnom Penh’s version is certainly more modest: three boats stop at six points along the Tonle Sap and Tonle Bassac rivers. 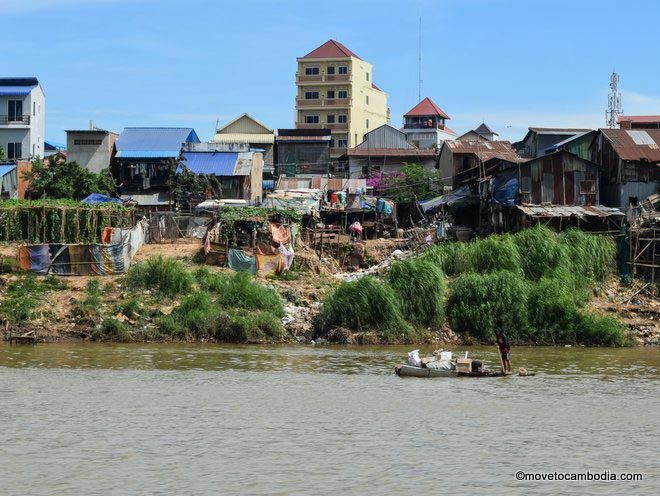 But the bright blue boats offer a fantastic way to witness the city’s rapid growth and development, see some of its more marginalized communities, and hang out with the Cambodians commuting to and from work or just going along for the ride. 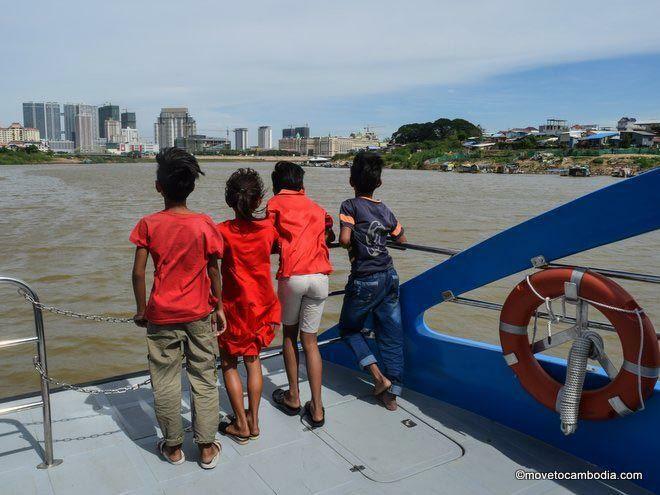 Phnom Penh’s water taxi makes for a fun day out (or an easy commute). Waiting for the water taxi to arrive at the stand behind the Cambodiana Hotel — one of two in central Phnom Penh, the other is opposite the Night Market — offers a clear reminder of just how busy Phnom Penh’s waterways are. The Vietnamese and Cham fishing communities’ small boats vie for space with the ferries crossing to the east bank of the Mekong or to the Sokha Hotel and cargo boats laden with agricultural goods or scrap metal. The water taxis themselves are all new, and the two larger models contain a Western-style toilet — luxury indeed! 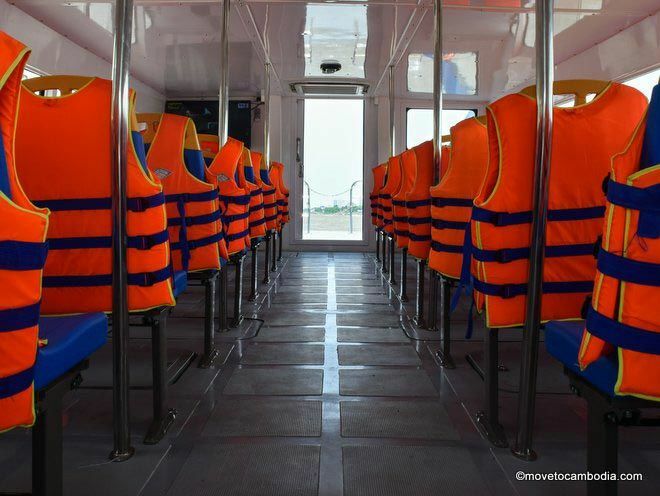 Each seat features a life-jacket, and the boats are never too far from the riverbank, reassuring in the event of an accident. In a nod to the seemingly compulsory television playing at the front of buses across Cambodia, the larger water taxis play daytime movies for those not interested in the Cambodia outside the windows, although thankfully they keep the volume off. 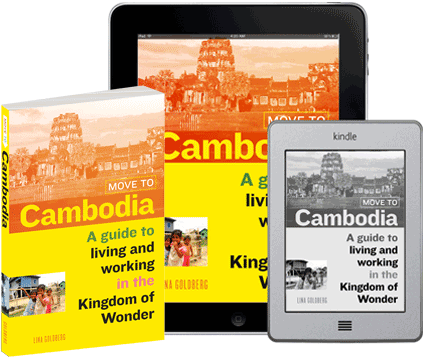 The 20-minute journey from the riverside down to the Takhmao terminus offers a unique perspective on how Phnom Penh has grown and developed in recent years, and the different communities involved in the process. The brightly painted Vietnamese Catholic Church of Christ, the gold and red of the Chinese-Buddhist temple in Takhmao, the orange roofs of various Khmer Buddhist pagodas, and the opulent homes of business and political elite fight for riverbank space with heavy industry and the shanty homes of the less wealthy. Hugging the banks amid reeds and piles of garbage are the numerous covered fishing boats that are home to the Vietnamese (pitched roofs) and Cham (rounded roofs) who eke out a living on the river. Seeing a different side (literally) of Phnom Penh from the water taxi. As with Phnom Penh’s growing bus network, the water taxi is aimed to boost transport options for the city’s students and lowest earners. The water taxi was originally free when it launched in April 2018, but that is set to change later this year, with prices for a one-way journey likely to cost around $1. Night Market to Takhmao: 6 a.m., 6:30 a.m., 7:20 a.m. 11 a.m., 11:30 a.m., 12:20 p.m., 4:30 p.m., 5 p.m., 6 p.m.
Chaktomuk (behind Cambodiana Hotel) to Takhmao: 6:10 a.m., 6:40 a.m., 7:30 a.m. 11:10 a.m., 11:40 a.m., 12:30 p.m., 4:40 p.m., 5:10 p.m., 6:10 p.m.
Takhmao to Phnom Penh: 5:30 a.m., 6 a.m., 6:50 a.m., 10:30 a.m., 11 a.m., 11:50 a.m., 4 p.m., 4:30 p.m., 5:30 p.m. 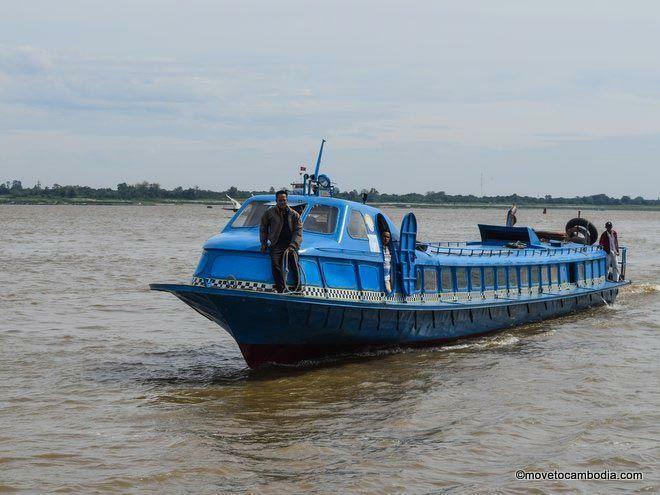 This entry was posted in Transportation, Phnom Penh and tagged taxi, boat trips. Bookmark the permalink. Sadly I can’t up load a pic of the timetable taken today 2/2/2019 but it does appear the timetable has been truncated somewhat. I also endorse it as great perspective to catch if your new visitor here. Hi. I don’t think that timetable is still correct. The day I used it (early December) there was no 11am from the Night Market, and also no 4pm return journey from Takhmao, so I think they have trimmed back services due to a lack of customers, as I was the only person on the 11.30am boat. The docker guy invited to help me onto the roof to enjoy the view though! I thought fares were due to be introduced in January? thanks alex. 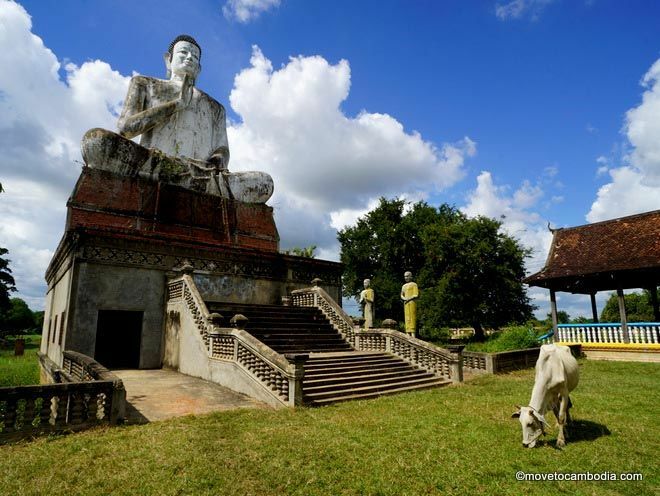 when is the right time to visit combodia? which month would be fine?